As one semiautomatic-toting gang ambushes another in their apartment, a narrator waxes on about the ancient Greeks and their views on fate; that there is no free will and one action is predestined to cause another. Amidst the mayhem, a tank containing a baby alligator breaks open, spilling the little guy to the floor. The alligator gets underfoot, causing the gangsters to trip and all kill each other in a hail of gunfire. Finding his way into an alley, the baby gator is attacked by a dog on a chain. The dog sends the gator running into a street and the chaos of the stopping cars sends the gator tumbling down a storm drain, into the sewers. The gator swims to a ledge, only to be attacked by a hungry cat. The feline swats the gator around until the little guy escapes through a narrow pipe. Coming out the other side, the gator is ambushed by a rat. The two tussle and go spiraling into the water. Finally having endured enough, the gator defends itself and kills the rat. It swims around for a while until it is discovered by a pair of TCRI employees (Utroms in disguise). As Doctor Xeinos plucks up the little gator and decides to keep him, the other worker sighs at the doctors affinity for “pets”. *This story is a decompressed retelling of Leatherhead’s origin, as seen in his first appearance in Tales of the TMNT (Vol. 1) #6. Leatherhead will appear again, chronologically, in Tales of the TMNT (Vol. 2) #38. *Doctor Xeinos is Doctor X, a recurring character who first appeared (by name) in TMNT (Vol. 3) #19. Chronologically, he/she will also appear again in Tales of the TMNT (Vol. 2) #38.
Who better than Ryan Brown, the creator of Leatherhead, to write a more drawn-out adaptation of his Mirage origin? Eh, no one that I can think of, anyway. The narration is a little on the purple side, going on and on about the Greeks and their pontifications on the nature of fate, destiny and free will. It tends to restate the same factoids over and over again, trying to stretch itself across 8 pages. While it certainly fits with the story, which is a chain reaction of events that led to Leatherhead becoming Leatherhead, it’s a tad overblown. I do like how baby Leatherhead basically runs a gauntlet of the cartoon animal hierarchy, going from dog to cat to rat, then basically having to work his way up the food chain from the very bottom (starting by eating the rat). The panel on page 8, a close-up of Leatherhead’s eyes as he finally fights back and draws blood, was a nice bit of foreshadowing toward Leatherhead’s eventual bipolar disorder: gentle, intelligent pacifism intercut with violent outbursts of mindless, animalistic brutality. 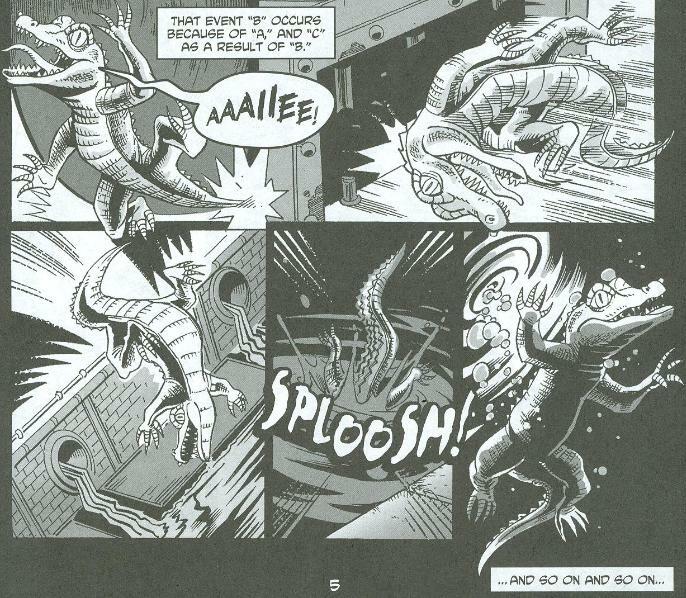 The artwork by Fernando Pinto does a good job of keeping the viewpoint at ground level as soon as Leatherhead is sprung from his tank, so you see the events from the height of a baby alligator. Not much else to say about the pencils; the action was laid out well but the style didn’t really “pop” for me. 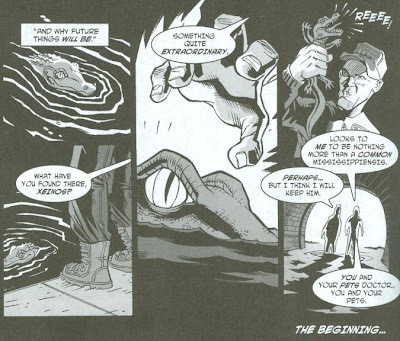 Was the stretched-out retelling of Leatherhead’s origin really necessary? Probably not, but it still made for an amusing little 8-page back-up strip and I think I prefer back-ups like this over the ones that end with bad jokes.